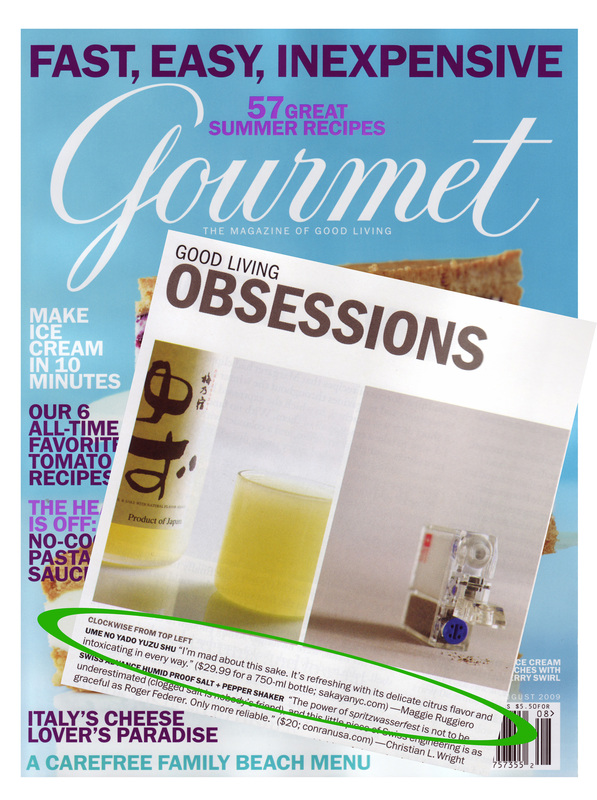 We are delighted that the August issue Gourmet Magazine features Ume no Yado Yuzu-shu as one of their “Good Living Obsessions” and notes SAKAYA exclusively as the place to buy it! We couldn’t agree with them more on this refreshing beverage as the perfect summer aperitif. Please drop by and pick up a bottle, you’ll be glad you did. Our apologies for the late posting of the July tasting schedule. Still remaining at this point are the noteworthy U.S. debuts of the Tsuki no Katusura Junmai Ginjo summer namazake from Japan Prestige Sake, Dassai 39 Sparkling Nigori, and Kikusui Organic Junmai. Please join us to enjoy these new arrivals and taste the latest offerings of the accompanying established favorites . We look forward to seeing you at SAKAYA! You are currently browsing the Sakaya NYC Blog weblog archives for July, 2009.